With our rich industry knowledge, we manufacture, Exporters and supply an extensive quality Barbed Wire Making Machine that is widely used in different engineering industries. 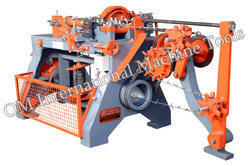 Our offered wire making machine is designed using optimum quality components in line with set industry standards. Moreover, provided machine is obtainable in various technical specifications and customized options as per the demands of our prestigious customers. Widely known for its reliable performance, and premium durability, our provided wire making machine is high on demand in the market.